After 19+ years, my Lawn-Boy finally shed enough parts that the mower repair people couldn’t keep it running. Crap, I had to buy another mower. I tried three different well known name brands in three years from Lowes and Home Depot and my experiences varied from disappointment to down-right infuriating. I found the 190cc Yardman at Walmart at 2/3 the price, and thought, “What the heck”. For 7 years this marvel as digested just about everything in its path. I change the oil, keep the blade sharp, and use good gasoline (none of that leaded crap) plus the additive that keeps the gasoline from turning into petroleum jelly. I went to buy a spare mower for the future, and guess what? Walmart (and/or MTD/Yardman), in their infinite wisdom, has discontinued the mower! A pox on BOTH your houses. 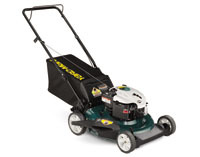 That was the best mower on the market, beating mowers twice its price. SHAME.